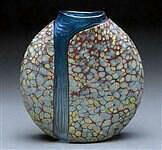 Thomas Spake Sandy Strata Vase. 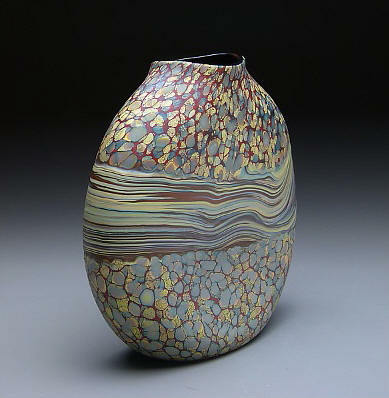 This hand blown glass vase is part of the artist's Strata Series,inspired by his interest in geology and the way that our planet's history is shown by the passing of time. 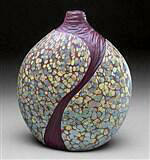 The intricate patterns are created from layers of opaque glass frit and powder in shades of tan, brown, sand, and red. The frit and powder are arranged in a pattern on a steel plate. 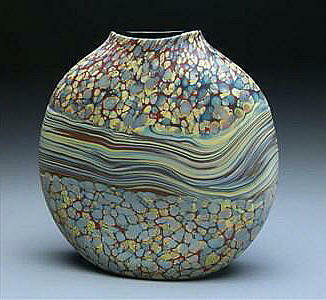 Then, the artist takes a gather of molten glass on a blowpipe and rolls the pattern onto it. During the blowing process, the colorful patterns melt to become part of the surface. A wrap of molten glass is added to create the central band. Once cool, the piece is sandblasted for a matte finish. The interior of the piece is opaque black. Approximate size: 8"h x 8"w x 3"d.